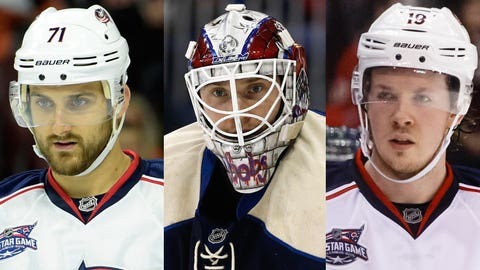 Columbus Blue Jackets 2014-15 All-Stars Nick Foligno, Sergei Bobrovsky and Ryan Johansen. Just a few days from now, all eyes of the hockey world will be focused on Ohio as the 60th NHL All-Star Game takes place in Columbus on January 25. It’s a celebration of the sport of hockey with the biggest stars of the league taking center stage. Fans from all over the world that descend on the city for this gala will leave with a newfound appreciation for hockey in Columbus. When the puck is dropped next Sunday, it will herald the next step for hockey in the United States’ 15th largest city. It has been a journey fraught with starts and stops along the way that will have taken 48 years, 3 months and 14 days to come to fruition. The genesis of professional hockey in Columbus occurred October 12, 1966. On that day, Columbus’ first professional hockey team played their first game. The Columbus Checkers, member of the now-defunct International Hockey League, played an exhibition game against the NHL’s Chicago Blackhawks at the Ohio Expo Center Coliseum, built in 1918. Coincidentally, the Blue Jackets played their inaugural NHL game, October 7, 2000, against the Blackhawks. The Checkers would last only four seasons, folding in the spring of 1970. One year later, the Columbus Golden Seals (IHL) took up the mantle for professional hockey in the city. They lasted two years and are remembered more for their white skates than for their record on the ice. In 1973, the Golden Seals were sold and renamed the Columbus Owls. They were still playing their games at the Coliseum, and due to scheduling conflicts for post-season play over a few years, the Owls relocated to Dayton, Ohio in 1977. The city would have to wait 13 years for professional hockey to make its return. To this point in time, the appetite for professional hockey in Columbus had merely been whetted. It had a precarious foothold in a city that was nationally known for its college football team and not much else. Against this juggernaut, it has always faced an uphill battle for relevancy. The afterthought that was pro hockey in Columbus changed in 1991, as the Columbus Chill (East Coast Hockey League) surged onto the scene. With three professional hockey franchises in Columbus failing in the past, a new and innovative approach was needed to make headway in the city. At the time, there were only two hockey rinks in Columbus, one at the Coliseum and the other was on the campus of Ohio State University. Chill team President/General Manager David Paitson realized there was a segment of the population that would embrace a pro sports team in a city dominated by college athletics. The challenge lay in finding a way to market pro hockey to those fans that desired it. "Columbus had all the makings, for sure," Paitson says. "There was this gap in the market for people that were pro sports fans that weren’t being served. We thought there was a chance, and this was the key, to break through. We were realistic enough to know that we could also fall on our face. That fear was a strong motivator to try and make it work." The idea of succeeding where others had failed, and playing in a building that was built three-quarters of a century previously, was daunting. To say Paitson and his staff thought outside the box would be putting it mildly. To get the attention of fans, they pushed the envelope further than it had ever been pushed before in Columbus. They became masters of tongue-in-cheek, outlandish promotions that brought an edgy feel to marketing a pro sports team in the city. "It was important to grab hold of folks and really shake them," he said. "We told them ‘come out, the atmosphere is going to be great, the game on the ice is going to be fun, we’ll do promotions that will get your attention and be a little crazy and you’ll get have a laugh’. And that’s what happened." The Chill rapidly gained a fan following that was loyal and garnered the attention of media outside Columbus, both nationally and in Canada. Their aggressive, in-your-face marketing approach would lead the American Marketing Association to recognize the Columbus Chill as the ‘Best Marketing Project" three years after they began playing. Paitson was named ECHL Executive of the Year in 1997. Although they only played from 1991-1999, they had a profound impact on hockey in Columbus and the surrounding region. While the marketing of the team may have been looked at as schtick, the real legacy of the team was in making hockey accessible to the fans. To that end, they are credited with being the first minor league franchise to own and operate their own rick facility. The Chiller Dublin was built in 1993 to alleviate the fact that they had to hold early morning practices due to the dearth of rink facilities. This was followed in 1997 with the opening of the Chiller Easton dual facility. More Chiller ice rinks were built in the ensuing years. Columbus was awarded an NHL franchise in June 1997. The Chill would play for two more years before voluntarily suspending operations to make way for the Blue Jackets. In essence, the Chill picked up the failed notion of pro hockey in Columbus and ran with it, before handing it off to the Blue Jackets. "It was a conscious decision between us and ownership of passing the baton," Paitson said. "We thought the best thing was ‘let’s hand the baton all the way off’. " The history of the Blue Jackets since grabbing that baton and marching forward has been succinctly chronicled. They, like others before them, have had their successes and setbacks in Columbus. But what started as a precarious foothold has now become enmeshed in the fabric of the city. Hosting the NHL All-Star Game is proof of that. The legacy of the Columbus Chill cannot be underestimated. In the twenty-four years that have passed since they started playing in the old Coliseum, hockey has simply exploded across Central Ohio. In addition to the Chiller franchise of rinks, more ice sheets have been built around the region to keep up with the demand. Columbus now has the third-largest USA Hockey registered adult league in the United States. 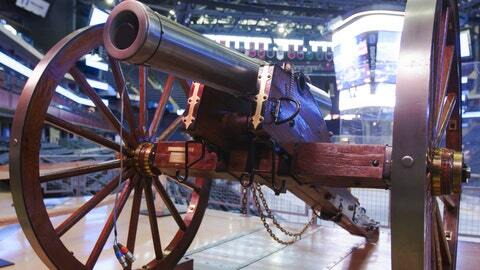 "The success of hockey here wraps around the success of the Blue Jackets," said Paitson, "in how far it can grow. It’s about having people have the fun experience of having a deep playoff run, what a Stanley Cup run would be like and rewarding the fans with that." While the All-Star game in Columbus next Sunday is a celebration of everything great about the game, the 48 year journey that brought us here is one that cannot be discounted when telling the story of professional hockey in Ohio’s capital city. It’s a history that is worthy of embracing.